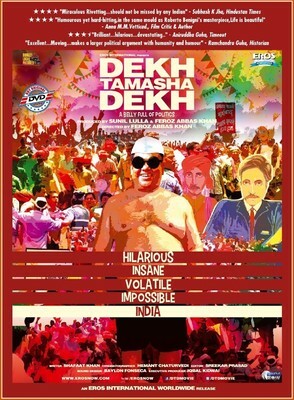 Dekh Tamasha Dekh by Feroz Abbas Khan (who previously made Gandhi, My Father) was an interesting if schizophrenic experience. The title and poster, which promise a rib-tickling farce, are misleading. Set in a small seaside town with Hindu and Muslim communities that periodically flare up at each other, the film deals with communal unrest, religious appeasement, suppression of intellectual and artistic freedom by the so-called guardians of culture and the profit-minded businessmen, taboo of inter-religious romance etc. While the film does take on a fair bit more than it can chew, it shows some absorbing straight drama, especially when it depicts the frustration of rational and civil minds against the monster of aggressive fundamentalism and cultural appropriation. In these scenes there is a simple direct approach that lends the story significant strength. On the other hand DTD has a big problem with consistency of tone. It's almost as if at some point they decided that the script should have satire and absurd humor, and be a form of Jaane Bhi Do Yaaron 2 (the opening scene features one of the most gratuitous and irritating uses of abusive language and sexual innuendo in the name of earthy humor). Sadly these elements don't work and jar with the straight material. When a hearing impaired historian pulls off his hearing aid to ignore the rhetoric of a fundamentalist ranting against his book, it's amusing and effective, but when that same act leads to his being unaware of his assistant being hacked to death outside his very door, it is reduced to a plot contrivance. Most of the cast is new to me, but they fit their roles nicely. There is some nice layering to the characters, like the passionate newspaper editor that's not above stealing credit for another man's idea, while the normally callous marketing guy is the one that balks at running a story based on inflammatory rumor. Satish Kaushik can be an excellent actor, but his character is reduced to a buffoon in a needless farce, (and his face on the poster is due to his relative name value than the amount of footage he gets in the film). The cinematography (Hemant Chaturvedi) and editing (Sreekar Prasad) are generally effective - the scene of the procession march towards the end is shot and cut in a manner that brilliantly amps the tension - but will occasionally become flashy in a distracting way. The end seems tame compared to the build-up, as though the film was in a hurry to reach closure. But this is still, with some caveats, an effective diatribe on the danger of losing our freedoms to the cancer of religion and social factionalism. Eros' DVD gives a good video presentation of the film (digitally shot, I assume from the look), and audio is pretty good as well. No extras, although the DVD case holds an free disc of another movie - Son of Sardar. It's like they were so worried about people straining their brains watching this movie, that they provide you with a massive dose of stupidity to bring you back to the comfort of Bolly-Zombie land.